Week 5 of RIX – What’s Black and White and RED all over? This week on the podcast we discussed the possible shifting of the meta-game at the local level due to GP Memphis having shown how broad this standard format can be. We had looked at our local lists and talked through the power of red in the format, particularly in Mono-Red Aggro. We spoke about how various decks could possibly have a good match up and if they did then we would see the meta-game pivot around these decks that could give an advantage over much of the rest of the field by being either more controlling than other decks, or having a hard to interact with win condition, but still surviving the early onslaught of red based decks. We talked about all of this before we had looked at the numbers. And now we have to double down on this sentiment because if you intend to do well at a PPTQ, fighting red should be your expectation, not something you can realistically dodge. Beyond the anecdotal evidence we have from talking to players at these tournaments that there is a lot of red in the room, we also now have compiled the data from the most recent weekend’s top 8s. There is a table below which shows the success each week of the decks we have seen, compiled by Simeon. The table uses our scoring system of winning deck gets 4 points, runner up gets 3, decks knocked out in the semi’s get 2 and the rest get 1 point. The table shows a combined score for that weekend, and its had a little bit of tinkering for us not knowing some of the final positions of some players in some tournaments, and a Top 4, but what it shows is reasonably clear. This format has a Hazoret the Fervent problem. At least locally, Mono Red is doing better than basically any other deck. And its dominance is increasing. Here is a graph showing those numbers as a percentage of the total available. 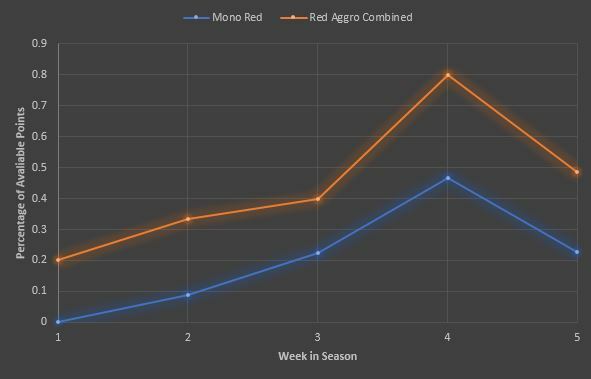 We can see an upward trend of Red Aggro in total, and Mono Red in particular. Red aggressive decks now account for almost 50% of all points scored last weekend, meaning that there is a lot of them, and they do well. I would recommend to everyone playing this weekend, either know that your deck can beat red decks, or follow the advice I have been given many times over the last couple of years.